Have You Suffered a Catastrophic Personal Injury? There are varying degrees of injury. Minor injuries typically include easily treatable ailments such as a strained/sprained muscle, cuts and first-degree burns. Moderate to severe injuries are mostly treatable and include bone fractures, concussions and second-degree burns. When a person suffers a catastrophic injury, he or she suffers significant trauma that will likely cause life-changing injuries. It can even cause an individual to suffer a wrongful death. Examples of catastrophic injury most often include injuries to the brain and spinal cord. However, they can also include limb amputation, para/quadriplegia and third-degree burns. Philadelphia catastrophic injury lawyer, Adam Grutzmacher, has dedicated his legal career to helping wrongfully injured victims seek recovery. Since graduating from law school and opening his personal injury law firm, he has successfully represented many fellow Philadelphians throughout the city. Adam is a staunch advocate for social justice. He will do whatever is necessary to see his clients through to a favorable conclusion. Our firm understands that this is an overwhelming and distressing time for injured individuals and their families. After getting to know you and the details of your case personally, Adam will develop a strong case that advocates for rightful compensation. Currently, there is no exact global definition of a “catastrophic injury”. Generally, it means that an injury is to the point that recovery will be difficult or impossible. These types of injuries often occur in the spinal cord, neck and head region. Such injuries typically lead to serious — often life-changing — effects. When a negligent party is responsible for an individual’s catastrophic injury, the injured party has a right to pursue legal action. What Are Examples of a Catastrophic Injury? Traumatic brain injury (TBI). According to the University of Florida Health (UF Health), “1.4 million people sustain a traumatic brain injury” every year in the United States. Of those, “about 50,000” suffer a wrongful death and “235,000 are hospitalized”. Examples of TBI’s include cranial fractures, “cerebral contusions” and concussions. Amputation. Losing a limb is one of the most significant injuries a person can endure. On top of the physical obstacles of an amputation, an amputee will likely be emotional about his or her situation. You can hold the opposing party liable for emotional pain and suffering as well as physical damages. Spinal cord injury (SCI). UF Health defines an SCI as spinal cord damage “that results in a loss of function below the level of the lesion, including paralysis, sensory loss, and bowel/bladder/sexual dysfunction”. As of 2018, “there are currently over 450,000 people in the U.S.” with SCI’s. Additionally, there are around “10,000 new SCI” cases every year. While negligent accidents often cause an SCI, one can also occur due to health-related factors. These can include tumors and infections of the spinal cord. If a doctor failed to diagnose these or other factors before an SCI, then you may be able to hold him or her liable for the injury. Cases involving catastrophic injury involve sizeable settlements. This is because these types of injuries are some of the most costly. They typically involve continual medical treatment and rehabilitation. Additionally, a catastrophically injured individual is unlikely to be able to work in the long-term. Yet, that person will still require a way to make ends meet. Adam is a dedicated and experienced Philadelphia catastrophic injury personal injury lawyer. He will fight for your best interests and fight to ensure that you receive appropriate compensation for past, present and future damages. Who Is Liable for a Catastrophic Injury? Truck drivers/companies. Semi-trucks and other similarly-sized commercial vehicles are some of the biggest on the road. When one of these tractor-trailer trucks causes an accident involving a passenger car driver, the results are often catastrophic on many levels. Injuries to passengers are often more severe than in a typical car accident. Additionally, physical damage done to vehicles is often unrepairable. Depending on the circumstances, you may be able to hold the truck driver responsible for the accident, as well as their employer, maintenance workers and/or parts manufacturers responsible for the condition of the vehicle. Government entities. You can also have an accident on a road, sidewalk or other government-controlled area. For example, if you were walking in a public park and you tripped and fell due to a poorly maintained walkway, then you hold the local government liable for any injuries. However, this type of claim will be harder to pursue since you are trying to sue the government, after all. But, it is not impossible to recover damages. That is when you need an experienced Philadelphia catastrophic injury attorney by your side. Medical professionals. Doctors are people too. However rarely, they do make mistakes. While mistakes are instances we can learn from, when it comes to you or your loved one’s health, there should be no compromise. Even in an accident, someone — even a doctor trying to help — must be held responsible for a wrongful injury and/or death. What are the most common examples of medical malpractice that can cause a catastrophic injury? They can include surgical errors, birth injuries and spinal cord damage leading to paralysis. Being injured is stressful. All you likely want to do is relax, recover and come to terms with your situation. After such an ordeal, you more than deserve to take that time for yourself. Adam’s aim as a local Philadelphia catastrophic personal injury lawyer, is to take the stress off your shoulders. Are you unsure about pursuing legal action? Do you have questions you need answered? Contact our office today to schedule a free consultation. During this initial meeting, you will be able to meet Adam and sit down with him to discuss the details of your case. He will be able to give you legal advice as to how to proceed. He can explain what you can reasonably expect. Additionally, he will also provide other valuable information regarding your catastrophic injury claim. 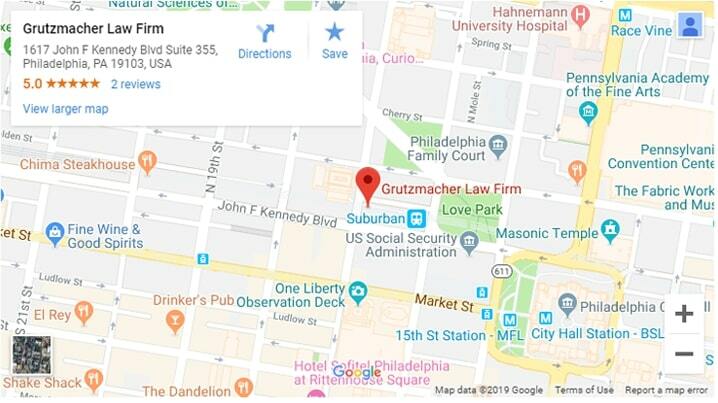 Call (215) 261-7975 or fill out our online form to see how Grutzmacher Law can help you today.